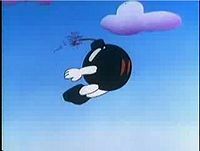 A Black Pit Bob-Omb is a large, extremely powerful Bob-Omb capable of creating an explosion powerful enough to create gaping pits, referred to as "black pits". In The Super Mario Bros. Super Show! episode "Rolling Down the River", Captain Koopa used a Black Pit Bob-Omb to create a black pit in a river; Captain Koopa does this to help him stall his opponent, Mark Twang, from beating him in a race to become King of the River. They went to the Mouth of the River to ask how to continue and she told them that there won't be a pit if the river flowed around it. After that, Mario and Luigi built pipes to change the river's flow around the pit and continued the race. This page was last edited on March 20, 2019, at 18:37.